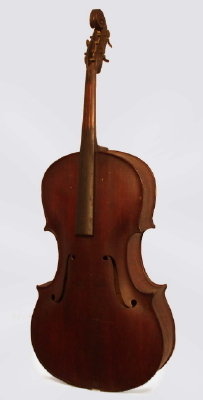 Church Bass, labeled John J. Pickering (March 14, 1857), full size, made in Greenland, NH, dark brown varnish finish, spruce top and back with maple ribs and neck. Overall length is 48 in. (121.9 cm. ), 17 7/8 in. (45.4 cm.) wide at lower bout, and 5 in. (12.7 cm.) in depth, measured at side of rim. Scale length is 26 3/8 in. (670 mm.). Width of nut is 1 1/4 in. (32 mm.). Overall Unrestored. Overall Excellent Historic Condition.